I’ve been trying some new recipes lately but I’ve not been taking the time to get pictures. Bad blogger! I thought I’d share anyway because these were fun, tasty finds. Mix the coconut oil, vanilla extract, eggs, almond butter, and almond milk together in one bowl. Stir the sugar, coconut flour and salt together in another bowl. Scoop dough, roll into a ball, and flatten. Place on preferred baking sheet/dish/stone. Bake for about 20 minutes until lightly brown. 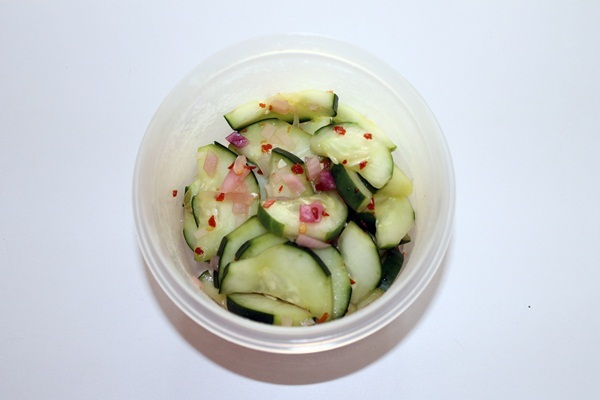 On a completely different note, I made a wonderfully sweet and spicy cucumber salad last night. This recipe came to me from Our Best Bites. I saw this new post to their site via fb on Friday. They titled it Sweet and Spicy Cucumber Slices, I like to think of it more like a salad. Regardless it was fresh and delightful. We had dinner guests last night and they were as pleased with the results as we were. Peel your cucumber. (We like to leave strips of the skin for color and a little texture.) Slice about 1/4 inch thick and then slice rounds in half. Place slices in a colander over a bowl, sprinkle with salt and toss well. Let sit for 1 hour refrigerated. While cucumber slices are draining, prepare the marinade. Combine vinegar, water, sugar and red pepper in a small saucepan; bring to a boil. (Make sure the fan in your hood vent is on and don’t breathe the fumes if you can help it. LOL) Once boiling, reduce heat and cook for about 10 minutes. Should reduce down to about 1/3 cup liquid. Remove from heat and add your diced red onion. Let cool to room temp and let rest until ready to add to cucumbers. When cucumbers are done resting, pat them dry with a few paper towels and add the vinegar reduction. Toss well. Chill for one hour (or longer) to allow flavors to combine. It was an excellent pairing with grilled steaks and asparagus. I did take a pic of the bit of leftovers this morning. I wish I had taken a shot last night of the whole dish in the white mixing bowl. It was so much prettier but this is still something I guess. This morning I’ve made biscuits and gravy again but this time I made the gravy with one can of evaporated milk, one can of water, and about 4 tbsp of coconut flour. The coconut flour does give the gravy a bit of a grainy texture but it still tastes great. It took far longer to thicken than I would have liked but that’s the way of gravy sometimes. I think maybe only 1/2 can of water would be enough and it would thicken quicker. Why did I change from my last recipe? I don’t have any cream cheese right now. For those of you viewing this on the site and not in your email, what do you think of the new look? There were limitations to the other theme I was using and I’ve been waiting for a new theme to be designed that might work better. This one has a few fun elements that I really like but it too has a few limitations I can’t control as well. I’m trying to decide the lesser of the two evils. So, any thoughts? I like the new theme, and I look forward to liking that spicy cucumber salad in the very near future. Yummmm. Thanks! Hope you like the salad. Remember, be one with your fan when you’re making the juice.